The Kongamoto are pterodactyl like creatues said to inhabit the Congo, Africa. "In Zambia and Zimbabwe, people are afraid of the flesh eating Kongamoto, a flying lizard with a great wingspan and a long beak filled with teeth, much like the long extinct pterodactyl". The etymology of Pterodactyl dates from 1830, from the french pt�rodactyle (1821), from the Mod.L. genus name, from Gk. pteron "wing" + daktylos "finger". Maybe of interest for further research "Daktyl" also refers to a member of a group of mythological beings who dwelt on Mount Ida (The tallest mountain on the island of Crete) and were metal workers and magicians. Pterosaurs were the first ever flying vertebrates (animals with backbone). This is symbolic of spiritual awakening. I believe that these sightings could be the ancestral, (genetic or perhaps oversoul/group) memories of Pterodactyl projected onto either the ghosts of long dead Pterodactyl or onto the subtle forms of demonic or other spirits. If the form of Pterodactyl is embedded in the ancestral memory of the local people it could be that in ancient times (pre-history) a form of Pterodactyl Worship was practiced. This page mentions a science fiction work "A Son of Noah" which includes "pterodactyl-worship on the part of a speciously advanced race". I personally feel that it is unlikely that Pterodactyl as real biological organisms still exist on Earth as they would have been spotted by satellite or aeroplane pilots/passengers. Although it is possible that Pterodactyl, like bats, were nocturnal and thus would be more difficult to spot by by planes etc. Two expeditions make their way into the heart of a forest near Mt. Ararat in Turkey - home of a dormant volcano that holds within itself a deadly secret that's been asleep for millions of years: un-hatched pterodactyl eggs! On a man hunt for a dangerous terrorist, Captain Bergen (Coolio) leads his military Special Ops unit deeper into the forest, while Professor Lovecraft (Cameron Daddo) and his team of scientists search for clues to the past when they make a dangerous discovery. Faced with the threat of the flesh eating predators, both groups come to the realization that they must rely on one another if they plan to make it out of the forest alive! With non-stop action and explosive graphics, Pterodactyl will make your fear take flight! Pterodactyl Woman From Beverly Hills at the Internet Movie Database. Plot: Pixie is cursed with turning into a Pterodactyl when her husband is caught messing with bones on an ancient burial ground. Her husband, children, friends, and neighbours must come to terms with Pixie's new "look". Her only chance to return to her normal state is to find the shaman who inflicted the curse on her. To give you a visual feel (maybe!) 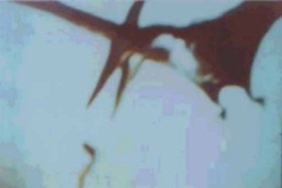 for Kongamoto here is a home video of a radio controlled Pterodactyl. However Giant Pterodactyl the Pteranodon had a Wing-Spread much larger: some 6 Metres.